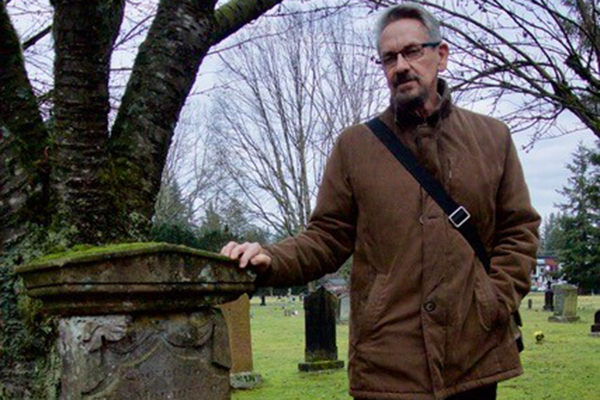 Warren Sommer at Fort Langley Cemetery, one of the oldest in the Lower Mainland. The Langley Heritage Society hosts a monthly podcast called Valley Voices. Have you listened in yet? February’s Valley Voices goes to Milner, once a thriving little town beside the BC Electric Railway tracks. We get a history lesson from long time resident, Ellen Worrell. And historian Warren Sommer gives us a preview of his Heritage Week Fort Langley Cemetery Tour. Valley Voices is heard Wednesday mornings at 11 am on CIVL Radio 101.7 FM at the University of the Fraser Valley, or via this link. The program is hosted by former CBC Radio broadcaster Mark Forsythe.